At eBay, my focus is on My eBay, where users manage items they are buying or selling on the site. I also work directly on, or consult on, numerous other areas of the site. The following are a few areas and features of the site for which I was the lead designer. When a member starts a listing to sell on eBay but doesn't finish it, eBay saves the member's information as a draft. I designed the area of the main Sell page that allows members to get return to their listings when they're ready to finish. The cursor is pointing to the link in the picture below. I also designed an accompanying email that reminds the member to finish the listing. Although the feature may look like a simple element of the page, the design required many iterations to balance the goals of the business and of members. In late 2004, eBay introduced a dedicated space in My eBay where members can read messages (emails) related to their account activities. My Messages is in many ways a webmail client, but it was designed to meet the specific needs of eBay messaging. The service currently allows members to read messages, but upcoming versions will also provide the ability to compose and reply to a wide variety of messages. I designed the interface for both the current version of My Messages and version 2.0, due later in 2005. My first foray into the strange, exciting, sometimes frustrating world of corporate design was at Yahoo! Inc, where I worked on Yahoo! Messenger, a leading instant messaging application. TIME Magazine featured Messenger in a sidebar article in early 2004. CNet rated it an 8 out of 10 and was the Editors' Choice in their comparison of IM clients. 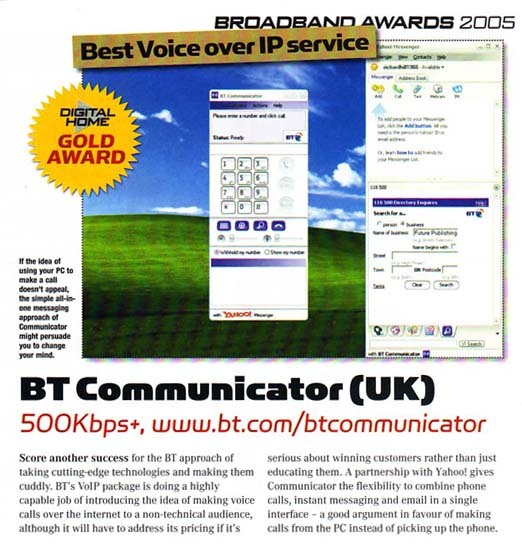 And the BT version (with its "cuddly" interface) won the Best Voice over IP service award from Digital Home Magazine. For nearly five years, I worked at Cooper, a small consulting interaction design firm. My work there spanned a wide range of domains including consumer products, medical systems, manufacturing. Below are a few examples. The GettyGuide handheld is an interactive multimedia guide to the Getty Center in Los Angeles. Along with its kiosk counterpart, the wireless handheld helps visitors find their way to exhibits, take an audio tour of the galleries, and access a wealth of information about the Getty's collection, from anywhere on the grounds. It is one of the first such devices to be deployed in an art museum. My teammate and I developed the design of the software interface from scratch, in close collaboration with the kiosk design team and Getty staff. 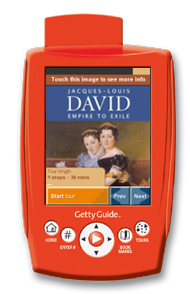 The GettyGuide handheld was launched in February 2005 to coincide with an exhibition on Jacques-Louis David. Most of my time at Cooper was spent in the role of Design Communicator, a job that's fairly unique in the design industry. Among other things, my responsibilities as a DC included designing, documenting, illustrating, managing projects, and presenting. For a more in-depth description of the DC role, read this summary. In February 2000, Interactive Week magazine (now eWeek) commissioned Cooper to create a concept product to illustrate how we design products. My partner and I came up with the Wayfindera simple airport navigation aide for wireless PDAs. The design was published in a sidebar in the February 26th print issue. A more detailed description of the project is available on the Cooper Concept Projects page. To accompany its DSL self-installation kit, a major high-speed Internet service provider needed a handy paper guide to help their customers go through the process of setting up their hardware and software. In a rare solo effort at Cooper, I designed, wrote, and illustrated the guide, collaborating closely with the client each step of the way during the two-week project. You can see the full PDF of the document here: Self-Install guide. What will the home electronics market be like in 5-10 years (from 1997)? Samsung Electronics posed this question in one of my senior studio courses. Through extensive market, technological, and user research, my group (consisting of three industrial designers), developed a network-based home media and electronics system. A base unit (left, the tall one) connects the home to content provider networkspay-per-view, the Web, cable radioand redistributes that content to nodes (screens, monitors, speakers, etc.) throughout the home. To allow users to share information and take it with them, we also designed a portable unit (the round one). Although these devices are fairly common today, in 1997 many of the concepts in this design were quite new. A project from an introductory architecture course, this watercraft is designed for a fictional cult of shark worshippers. The translucent bottom fin, which houses the living and worshipping quarters, sits below water so the inhabitants of the craft can view and worship sharks as they swim by. This exhibit is an informational display dedicated to the early twentieth-century inventor Nikola Tesla (a hero of mine). The exhibit would be installed in a museum in conjunction with a biographical film about Tesla (such as the PBS film Tesla: Master of Lighting). Materials, graphics, and forms for the exhibit were chosen for their metaphorical and literal connections to Tesla's work and ideas. My entry in the 1995 Industrial Design Student Innovation Excellence Awards, this toothpaste dispenser is designed for the special needs of people with arthritis. Its pressurized pump system allows it to be used in a variety of different orientations (such as in the hand or on a countertop) by a variety of different people (adults, children, people who have arthritis, people who don't). Another architecture assignment, the goal of this project was to design and build a candle holder. The two candles are balanced on the base, symbolizing the give-and-take relationship that forms between two friends. The theme of this project was "public vs. private": how does one design a space for private activities that must exist in a public place (such as ATMs, pay phones, or restrooms)? To address this question, I designed public seating for the private activities of reading, sketching, or writing. The result is a set of three different concrete forms that can be arranged in a wide variety of combinations. They allow the user to find his or her "nook" in the public place. The goal of this independently-defined project was to answer the following: To what extent can a form language be applied to a family of products? By first selecting an environment (the kitchen), then brainstorming concepts for simple products within that environment (timers, knife sets, salt and pepper shakers, etc. ), I developed a general form language. I then applied that form language to two distinct, but related, products: a timer and a knife set (not shown). The answer to the question? As the number of products (or sets of products) in a product family increases, the level of shared detail in the design of the products must decrease. This project was an individual warm-up exercise for the team project with Samsung Electronics. The assignment was to design a high-definition television given a number of internal components. This design is intended for the medical/surgical marketthe television hangs from a support cable (which also houses power and video connections), allowing it to be retracted to the ceiling when not in use. During my third year, we were given a couple "breather" projects. One such assignment was to design a time-keeping device. There were no restrictions other than the design had to incorporate a supplied clock mechanism. My design is intended for a specific environment (my parents' home, where it now hangs), so I incorporated colors and form cues that exist there. This drawer pull was designed for a manufacturing and production course. After designing a pull for a set of pre-fabricated IKEA drawers, the design was taken to a machinist, who made an aluminum master. The master was used to make an RTV plastic mold. The mold, in turn, was used to make reproductions of the pull, which were then painted and attached to the drawer set. Another "breather," the assignment for this project was to perform three mechanical operations on a rectilinear form, then reassemble it into an interesting composition. This form was drilled once and cut twice. This was my entry in the First Annual CMU IDSA Pinewood Derby. It wasn't quick enough to win the speed category, but it did win Best Design and Best Craft (for which I received two bottles of cheap champagne).